Epicurus (341-270 BC) was among the most significant of the ancient Greek philosophers and the founder of the Epicurean school which is named in his honor. Epicureanism taught that one should live a life free of pain and worry, a condition he called ataraxia, or perfect peace. More controversially, Epicurus also stated that the universe was infinite and that the gods had no power to inflict punishment on human beings. 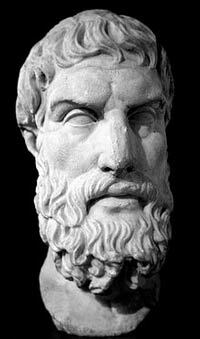 Epicurus was born on the island of Samos, an Athenian possession. As a teenager, he was taught philosophy by Pamphilus, a Platonist tutor, after which he engaged in two years of compulsory military service. He then rejoined his family, who had by then moved to Colophon, which is now part of Turkey. He continued his philosophical education, learning the works of Democritus and others. He then taught briefly in Mytilene before some unspecified problem forced him to move to Lampsacus. Having founded a school here in 306 BC, which he dubbed The Garden, he went back to Athens where he lived until his death. The name of the school that Epicurus began came from its location at his home. It was notable for being the first school of philosophy in the ancient Hellenistic world to allow women to study. Friendship was considered highly important in the Epicurean worldview, and so the philosopher encouraged his students to set up friendly communities. Epicurus never openly admitted that his teachings were inspired from others who he learned from, such as Democritus. It was at this time that he wrote three letters which are his only complete surviving works. He died aged 72 in 270 BC, having suffered for many years from kidney stones. Epicurus taught that observation and deduction were vital to the understanding of nature. He was among the first to develop modern ideas of the laws of physics and even a certain amount of atomic theory. He also believed that everything that happened was the result of the collision and mingling of tiny particles. As a strong believer in egalitarianism, Epicurus helped to found the ancient Greek view of ethics as central to everyday life, in particular what he called the “Ethic of Reciprocity.” He parted company with Democritus, with whom he otherwise broadly agreed, in that he believed that atoms could be deflected erratically rather than always traveling in straight lines. Despite his relatively modern scientific outlook, Epicurus was a participant in more traditional Greek religious ceremonies. He saw these activities as a way to consider the nature of the gods, but also as important in their own right for living a tranquil life. He disagreed with the common view that divine punishment would be used against people who were evil but that the good would be rewarded. Instead, he advocated the pursuit of pleasure rather than pain. However, he went on to say that the ideal state of calm could only be achieved when neither pain nor pleasure was being felt. Epicurus stated that death should hold no fears since it marked the end of consciousness and also the end of both pleasure and pain.